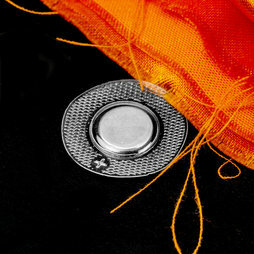 These are disc magnets (12 x 2 mm) with an adhesive force of approximately 1 kg, shrink-wrapped into a round PVC cover. They can be sewn into clothing or used in wet surroundings without rusting. A sales unit contains a strip with 10 magnet pairs, which equals 20 individual magnets.